After the attempt to purchase the Timex GPS on eBay met with an unexpected non-delivery by our own authorities, I am super caution about buying anything online if the packages aren't trackable. I am not sure if it is my fault for taking the normal mail (due to cost) or just plain unlucky. It is often tough when the mail are not trackable and the authorities are dictating how things should be coming in. 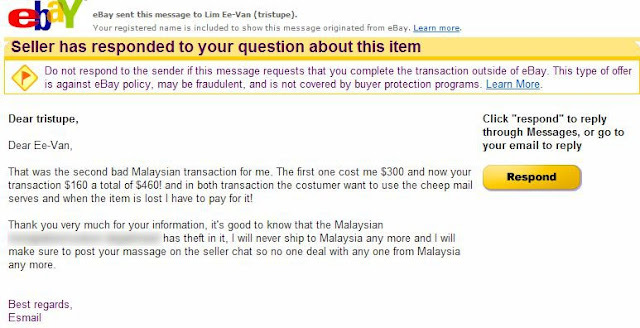 Having said that, i received my full refund thanks to the eBay seller. Bad point is that he has now banned selling anything to Malaysia - no thanks to the relevant department that has likely taken the watch. See How Malaysia became Truly Asia? Anyway, my quest to "upgrade" from the current Polar RS300X to a GPS enable watch is just a way to reward myself for bringing my weight down from 85kg to 67kg, but you know that is just an excuse for an upgrade. I have been carrying my iPhone to be used to track my runs. But dilemma comes in if i need to track my cycling or even swimming. Can't possibly bring the phone into the water, can i? I bought my Garmin Forerunner 910xt from Quick-Sports based in Frasers Business Centre, Kuala Lumpur. There were special offer in stroe during the Energizer Night Run and the price differences between an unit i enquire from Australia vs. the unit Quick-Sports is offering is just RM140.00. For that amount, i will buy peace of mind and easy warranty claim if anything goes wrong. Very small price quantum to pay for if you asked me. I went over to the shop and spoke to Yong, which pretty much runs the shop. The initial setup was done by him so i could instantly use the watch as...a watch. Just remember for some of you that is technologically challenged, a GPS enabled watch does not require you to "set the time" as the time will be automatically updated by the Satellites. I have seen how a few friends (no names mentioned) asking in social media pages "how to set the time in my GPS-enable device". Funny if you think about it as the instruction for that is usually "go stand outside for 1 minute". Here is my very brief review of the Garmin Forerunner 910XT. It will not be as detailed as the 100 pages done by DC Rainmaker (he is the ultimate sifu in this,i salute you), i have no intention to go that in detail as my concern is just to make it work for me, the way i want it to be. The 910xt comes with just a simple box. Opening it up will reveal a host of items inside.. Comes standard is the charging console that has three different attachment for the usual electricity plug point (US, UK and Euro), the charging cable, an extension strap to be worn with wetsuit, the ANT+ dongle for the watch to communicate with your PC, the HR strap, the HR unit, a bunch of "Quick start" booklets in all language possible and finally, the watch. Can you identify the parts? With that many things in the box, which one do you only need for normal function to record HR, speed and time? Well, ONLY these! (from left to right, clockwise): The USB charging cable, The 910xt, the HR strap and HR module, the main charger for faster charging and the the ANT+ dongle. The unit claim to have fast locking onto satellite within 1 minute. In building i am suspicious, but outdoor while testing it, it was locked on within 30meters of being under the sky. Garmin being GPS makers should have big advantage over anyone else doing this. Earth to Mars, do you read me? One of the biggest reason why i bought this was because of the watch ability to be a real triathlon watch. It is purpose made for that where it can actually record your swim in open water or in swimming pool. I am yet to try that. Having said that, it has a mode solely dedicated to the sports that has the word "multisport" on it. I have to try using it or simulate a "tri" to see how it works in T1 and T2. It allow tracking of all three sports and monitor vital information separately. The watch came pre-charged at 25% and it took me about 2hours to get it up to 100%, which is pretty fast. I am yet to charge with the laptop or portable power to see the speed to charge it. This is important if you are always on the move and do not want the GPS to die on you just when you plan for a run the next morning. It provides option to travel light minus the additional wall charger. The watch allow the user to program the viewing window. Which is a very nifty feature. It allows up to 4 different window to be customised. Seen below is in "bike" mode where I will show what the customization can do. Then choose how many fields you want to see in that window. I set it to three. Once that is done, you have the option to change what data you want to see in each field. Here is specific to cycling. This unit is compatible with all ANT+ devices, meaning if you have a cadence meter or speedo that works on ANT+, they will pair up like magic. Same as power meter, if you have them. Here in this example, i set it to see TIME ELAPSED, TIME OF THE DAY and DISTANCE. You can play around with it and after using it for about an hour, I pretty much know what i can customise. They say no info is bad, but too much info is not any better. So customise properly or you will end up looking at numbers not knowing what they are actually! Another feature is the ability to create custom workout. This is how it is done in the simplest manner. Go to Workout and select Custom. I set the first option called Run 00 to be my 1 Mile custom workout. You all know how much i love my 1-miler right? 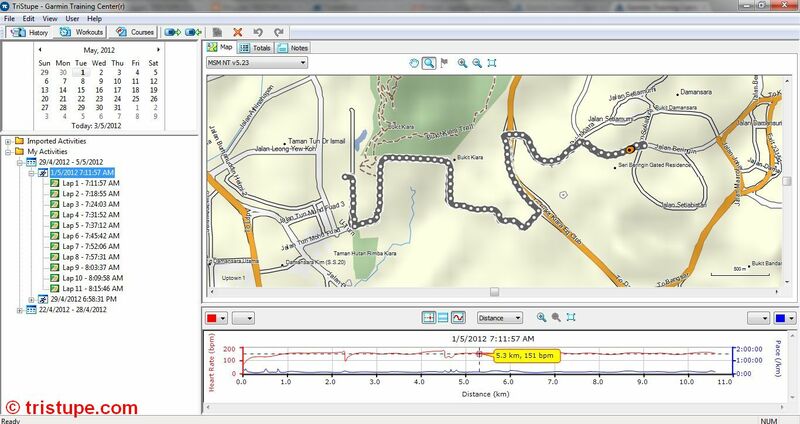 The customization allow you to set the "duration" as a measurement of pace, speed or distance. It then allow you to set the "target" where you can either measure the workout based on pace, heart rate or other parameters. If you choose pace as your target, it then allow you to further choose if you are walking, fast walking, slow jog, jog, run and sprint. The pace shown is pre-calculated out or pre-program in the watch. I am yet to test if it can be changed. Once you are done, pressing the exit (MODE) button and selecting the 1 Mile custom workout will allow you to start the workout, or do further editing. This unit will be(or by the time this post goes up, HAS been tested) during the Orang Asli Trail Run and the Chicken Sperm Loop (updated: May 17. The unit has been taken for a run at Borneo Marathon too, amongst the many runs done recently as part of training). 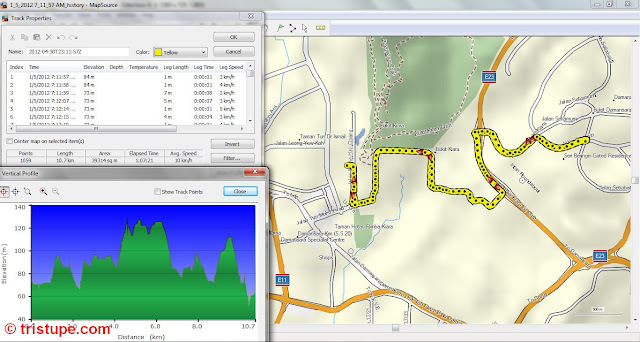 There are many more features especially when it is used to connect to Garmin website or other Garmin software such as Training Centre or Mapsource program. I have both installed as i rely heavily on GPS on many occasions especially for travel and work (and workout). So, it is a very familiar feel without having to learn or re-learn the software further. I will from time to time, write more about other features that i find in the watch for sharing. I believe my learning curve on this baby will not be more than a week or three days at most. :) By the time this blog post is published, i dare to say I am 99% competent to answer any questions or queries, if you want to ask. 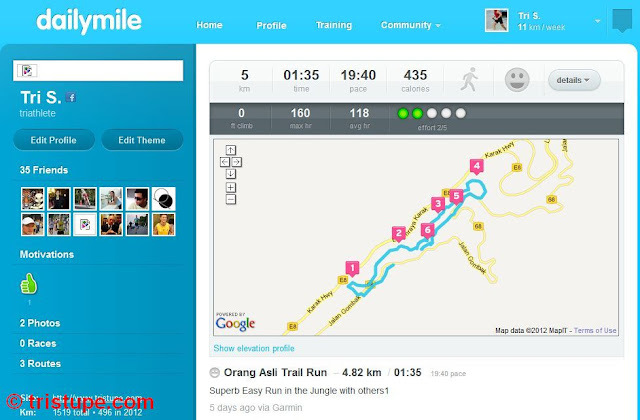 So, stay tune to this blog as i post more other good to know features of the Garmin Forerunner 910xt! The plus point of this watch is that it connects directly to the Garmin Connect website where you can upload your workout for instant data sharing. If you choose not to use the Garmin Connect, you can always download the Garmin Training Centre (TC) program or Garmin Mapsource program (both are free) so you can have option to monitor your workout. The integration with Dailymile.com is simple as there is a Garmin link (in Beta stage, stable, but has teething problem). All in all, it WILL satisfy the "data-nerd" in all of us. What we do with these data, however, is up to the person. For myself, it serves as a record on my own ability - for i am training to be in-tune with my own limits like how i want to breach the 7:30minutes for the 1-mile run. - Fast GPS capture due to Garmin hotfix feature (basically, it meant if you run your GPS at the same location most of the time, it remembers your position and lock onto the satellite fast. If new place far away, takes up to a minute, which is still, fast). This will be reviewed separately in two days time. Bargain and For Sale - SOLD! Having said that, i am selling my Polar RS300x that comes with the HR module and the Polar S1 Footpod to record distance and pace. If you are interested, please email me at im at tristupe.com. I bought the unit in August 2010 and it has been in service since, serving me really well. The item is in it's pristine condition. Selling price, brand new is RM850 and i am looking to sell it for RM480. Reader of my blog will get some discount, definitely. The RS300x box is still in perfect condition, including the plastic that holds all the items. Great product...just share my data at Garmin Connect.. Very informative review to many! Thank u! Abang Orait - done. will sign up and see what they have. Will you be able to compare this with Ambit Suunto? Fariz - unfortunately, no. Unless Suunto send me a test unit for review. :) Apologies for that. But look out for the Timex GPS review somewhere in near future. As my reviews are mostly not paid (aka i buy the item and i review them), it is very limited to what i can afford. Between ambit n 910xt, which one will you choose? If money is not a problem lh. Hope garmin ppl is reading this and will be able to lend them a unit for on field testing. Maybe i should write to them and see if they are willing to lend an unit to me for a week or two review. TO be very frank, SUunto Ambit looked more feature packed from the marketing point of view. For my level of activities (no need for barometers or weather prediction), the 910XT seems to suit me more, for now. also, weather prediction is subjective to the user's interpretation as barometric fluctuation could not be picked up by some people due to inexperiences. You also need to be at the place at least 48hours to let the computer compute the fluctuation/normalise it. but one thing i must say i am very impressed - 100m water resistant. Can bring diving wei! 910XT only up to 30m. Thanks for your comment. Now, how to convince my wife? Hehehe. Fariz - if you have been married long enough, don't. Just do it and get her one too. George - so sorry to read this! I agree, the mass swim start is a contact sports by itself. Perhaps i am lucky enough as i usually wait out towards the end. If I want to track position, elevation, and speed, will the watch alone do that? Or do I need other attachments? How is this watch with a bike? 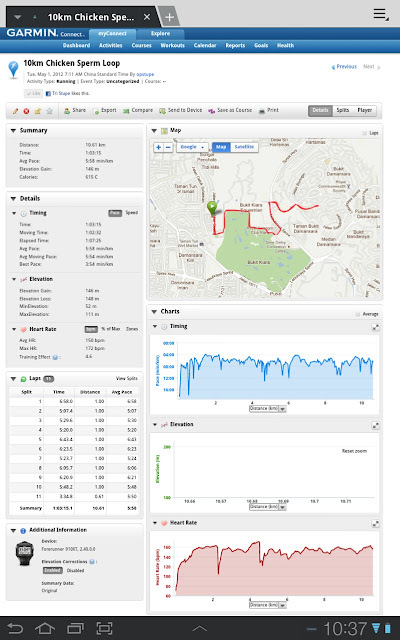 Got the Runs - The watch alone will record it and you will need to upload the data to the (free) Garmin Connect online and you will get all the items you needed. can we buy garmin from US and use it in Malaysia? Need to update map? YT - there is no "map" in the 910xt. the navigation just show trace of where you went. So, yes, you can get the 910XT from US and use it here. :) The firmware update and others are universal from GarminConnect. Hi. I enjoyed reading your 910XT review. I understand that you always do trail running which always takes place in jungle or under tree canopies. Is the 910xt GPS signal or accuracy affected when sky is heavily blocked by trees. I own a cheap GPS watch and found the distance and pace is always varies when the sky is blocked by trees. Teh Wei Leng - thanks! No issues with the 910xt with regards to the performance under canopy. I've used it extensively and has tracked Bukit Kiara many times using the 910xt without issues. This is the latest run i did at Kiara. You can pretty much see every turns i take. Switch it on the hybrid view and you can see the dense canopy. Which GPS watch are you using? Hi.Thanks for reply. Mine is Soleus GPS 1.0. I used it to track my jogging distance. I mainly ran along the side walk which is always covered by tree. when sky fully blocked by trees, I found out the pace always stays "constant" even though I deliberately slowed down my pace. All GPS watches has a firmware and a hardware. There will be noticable delay on all GPS watches. When you stop, it doesn't always STOP immediately. likewise when you speed up. 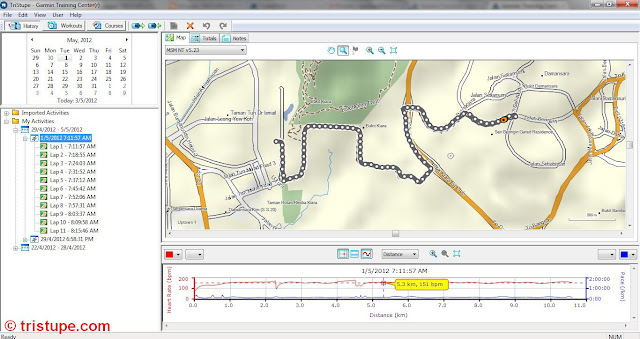 A good/better GPS watch will compensate these changes better by smoothing out the speed gain/loss using their firmware. So, there is nothing wrong with your GPS with regards to that. However, the speed of aquiring of the satellite signal, however, greatly depends on the hardware and the firmware. Hi. Thanks for valuable info. Hi, thanks for your great review. One quick question on battery life: in the manual says it can last up to 20 hours with GPS on. But how long can it last if used just as a watch, with the GPS and other features turned off? Good question. I used the watch for a spinning exercise (1 hour) a day before with only HR as the monitored parameter. I then synced it, forgot to switch it off and only realised it the next day. It was left on for at least 24hours. Awesome simple review dude. But how does it compare to the Polar RCX5? Any ideas? Hello! Very very late reply - I am sorry but I have no experience with the RCX5. One thing for sure, the RCX5 is sleeker compared to the boxy 910XT.